In the last 50 years, the wild tiger population has shrunk from 45,000 individuals to just 3,800. If the current trend continues, tigers could be extinct in the wild by the year 2022. 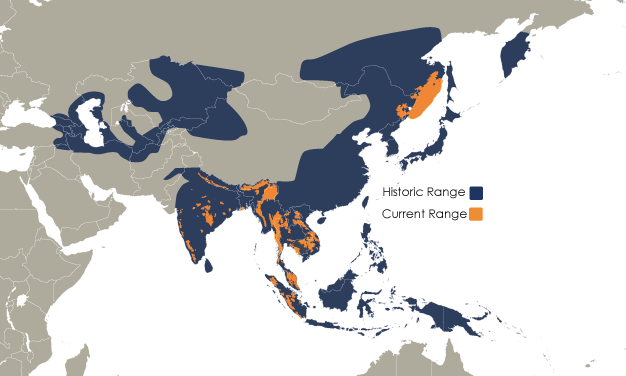 Today, wild tigers occupy only 4 percent of their historic range. Tigers have always been both admired and feared by humans, leading to their decline. As the human population increases, so does the demand for tigers’ natural habitat, their resources, and, unfortunately, their parts. The slump in the tiger population also produces the loss of thousands of other species of flora and fauna. Tigers are considered an umbrella species; if the tiger is saved, then millions of animals and plants that live in their territories will also be saved. 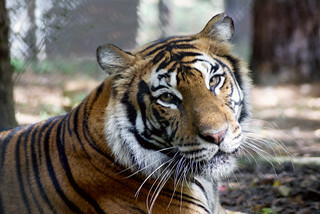 The fate for captive tigers in the United States isn’t much better, and Carolina Tiger Rescue works to save these wild cats in the wild and in captivity. There are an estimated 10,000 tigers in the United States, with only six to seven percent of that number in accredited facilities. The remainder lie in the hands of private owners, roadside zoos, or the entertainment industry. It is estimated that there are more tigers in the state of Texas than than in the wild. North Carolina — along with Alabama, Nevada and Wisconsin — is one of four states without any state laws addressing the private ownership of wild cats. Habitat loss is a major threat facing wild tigers. As the human population increases, so does the demand for tigers’ habitats. The wild tiger population has decreased from 100,000 to 3,200 in just the last 100 years, and palm oil farms are a huge culprit. More than 300 football fields of tiger habitat is cleared every hour to make room for palm oil plantations. Palm oil is very cheap and easy to grow, and it can be found in more than 50 percent of all consumable goods. Limit your consumption of palm oil to help wild tigers! If we decrease the demand, we decrease the number of palm oil plantations. A dead tiger is unfortunately worth more than a live one to poachers. In some cultures, every single part of a tiger can be sold, ringing in around $60,000 for one cat! Wild tigers are hunted to meet the demands of an illegal wildlife market that rakes in more than $20 billion a year. 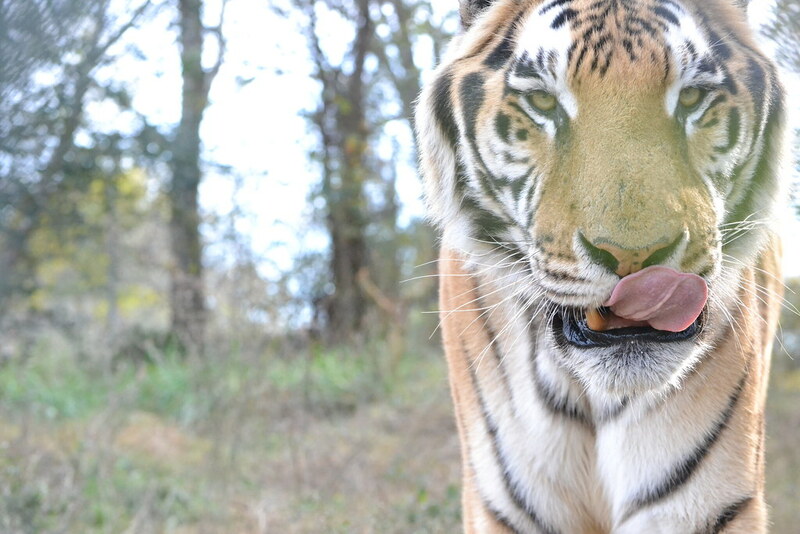 Carolina Tiger Rescue is opposed to poaching and other forms of illegal hunting. People regard tiger parts as extremely valuable — even the ground they die on is up for sale. In some cultures, the cat’s parts are consumed for medicinal purposes. In captivity, when a tiger bred for exploitation becomes too large to handle, they are often sold into the parts and pets industry. 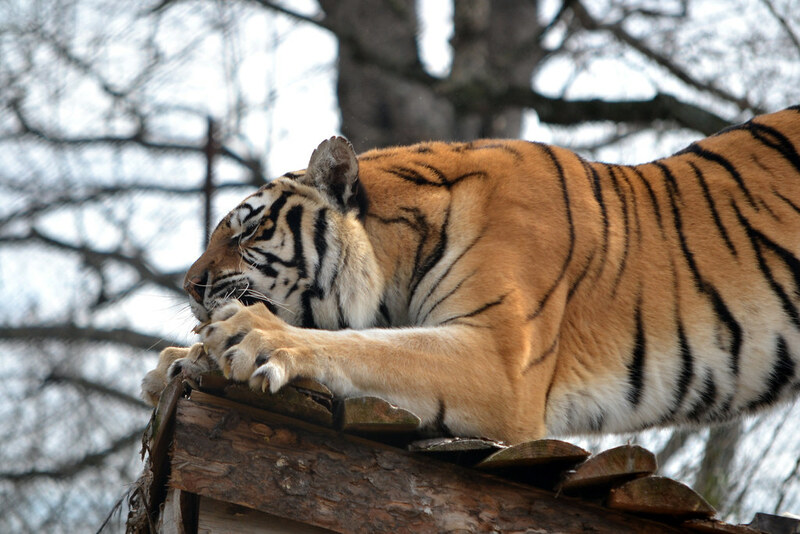 Help tigers by avoiding businesses or individuals that exploit wild animals. Without drastic change, the fate of wild tigers is grim. If nothing changes, estimates suggest wild tigers may be extinct in just four or five years.